Reserve time on September 12 and 13 to listen to award winning James Beverly talk about his series, Seamus the Sheltie. Are you a parent who is struggling with how to talk to your child? Just do not know how to approach certain topics like morals, death, or bullying? Listen as child psychologist James Beverly talks about his series to help parents – Seamus the Sheltie, a loveable dog who has humorous adventures while learning about the world around him. Mr. Beverly used the storytelling techniques of his grandfather, with the addition of animal language for Seamus, and a whopping dose of humor to help the medicine go down! Having encountered many parents and children who needed help, Mr. Beverly was inspired to write these wonderful tales to assist those he cannot get to. Written to appeal to children, while dealing with subjects parents know must be addressed, Seamus the Sheltie is a definite read. as well as at Amazon.com, however – Amazon does not offer a Special Coloring Book when you visit their site. Just click on over to Seamus The Sheltie, visit his Secret Place, and download a free coloring book! Do not delay! Go see Seamus today! James Beverly’s Seamus The Sheltie now available on IBooks! “Seamus the Sheltie” is now available as IBooks! Child psychologist James Beverly now has his loveable Sheltie, Seamus, available in IBooks helping parents and adults tackle the everyday challenges of guidance to growing up. Corinth, MS, August 23, 2011 – Now your child can “Laugh and Learn” with Seamus in IBooks as the gentle sheepdog guides them through more of the many challenges of growing up. All three of the Seamus the Sheltie books are now available in the Apple ITunes bookstore as IBooks. If you sometimes have trouble finding the right words to comfort your children when they encounter difficult or frightening issues, or feel unsure of how to share with your children your family’s values, or feel ill prepared to explain difficult or moral situations – then the Seamus the Sheltie series of children’s books were written for you. It’s not easy being a kid. There are lots of things to know and learn, and some of them are scary. It’s not easy being a parent, either. Sometimes it’s hard to find the right words to explain a situation, share our values, or comfort our kids. These Nationally award-winning books help both parents and children to talk about important subjects with the assistance of an unusual guide – a Shetland sheepdog named Seamus. · Visit the Seamus website at http://www.seamusthesheltie.com. Here you can order signed and personalized books, watch a Seamus video, listen to a animated reading by the author, get a lesson in “Seamus-Speak,” download a free Seamus coloring book, read all about the author, listen to a national radio interview with the author, see lots of real Seamus photographs, link to the Seamus Store, and even email the author directly. · Visit the Seamus Store at http://www.Cafepress.com (or follow the link from the Seamus website). Seamus fans can now have their little hero on tee-shirts, sweatshirts, caps, mugs, badges, tote bags, mouse pads, and even wall clocks. Seamus even has a tee-shirt for his animal friends. Fans can pick the full color photo of Seamus from the cover of “More Tales of Seamus the Sheltie” – or choose from six illustrations that were picked by kids from the Seamus the Sheltie books. 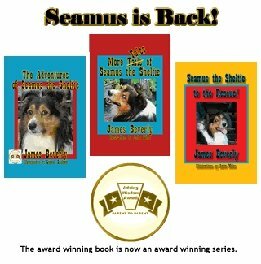 · Visit the Apple ITunes Bookstore and purchase the Seamus books as IBooks. · The Seamus the Sheltie books are also available at Amazon, Barnes & Noble, Books-A- Million, and most major book retailers. Recommended by parents, grandparents, mental health professionals, Special Education teachers, Psychiatrists, and the National Parent-To-Parent Organization. Winner of four National awards including Best Children’s Book. Don’t wait! Go see Seamus today! James Beverly’s Third Seamus Adventure NOW AVAILABLE! Are you a parent who is struggling with how to talk to your child? Just do not know how to approach certain topics like morals, death, or b ullying? Here are some great books for you! Meet Seamus the Sheltie, a loveable dog who has humorous adventures while learning about the world around him. Written by child psychologist James Beverly, Mr. Beverly used the storytelling techniques of his grandfather, with the addition of animal language for Seamus, and a whopping dose of humor to help the medicine go down! Having encountered many parents and children who needed help, Mr. Beverly was inspired to write these wonderful tales to assist those he cannot get to. Written to appeal to children, while dealing with subjects parents know must be addressed, Seamus the Sheltie is a definite read.